With Easter just around the corner, I thought I’d share a new favorite recipe that is bursting with spring flavor! 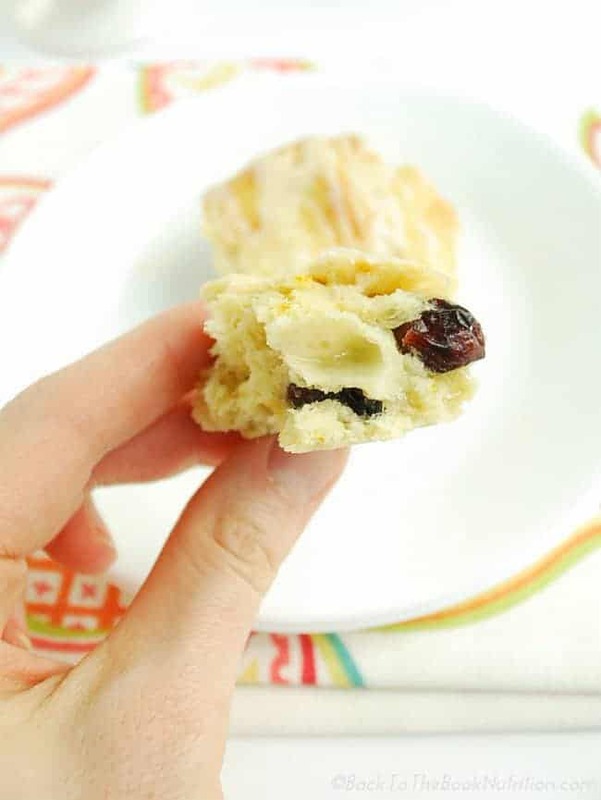 These Brie and Cranberry Scones are nothing short of fantastic, and they would be the perfect light and bright addition to your Resurrection Day menu! In fact, we ate all of ours within a day of taking the pictures for this post so, if you do make them, maybe drop some by my house? Thanks. Ever since that Baked Brie with Apples and Shallots in a Sourdough Bread Bowl knocked our socks off back in December, I’ve been tinkering with nontraditional uses for the classic French cheese. And as soon as I saw savory Brie Biscuits from Love Grows Wild, I knew I had to try them. So we did, and they were great, reminiscent of my Herb Scones with Lemon and Parmesan from last Easter. But I’ve always got one eye on the sweets…especially when there’s a holiday coming up. And, let me tell you – Brie and cranberry together in a scone is amazing! These are a holiday treat, so I pulled out all the stops with the healthiest versions of white flour and granulated sugar (learn which Healthy Holiday Baking Ingredients I buy), and these are so worth it! The tiny pockets of mild, gooey Brie beautifully compliment the tart cranberries and sweet orange icing. Plus, they’re ready in half and hour so you can still make it to church on time! Pop your butter and Brie into the freezer for a few minutes while you measure your dry ingredients. This makes them easier to cut and also helps achieve a crumbly (not mushy) dough to ensure perfect flaky layers when baked. Dough for scones and biscuits should resemble course crumbs before the wet ingredients are added, and should be lumpy afterward. Overmixed dough will yield a flatter and more dense scone/biscuit. When ready to form the scones, gently pat the dough to form a circle and use the rolling pin only minimally. Similar to #1 and #2, the idea is to keep the dough as light and airy as possible so that the butter and baking powder can work their delicious, fluffy magic between the layers of dough. Place butter and Brie in freezer while mixing dry ingredients. In a large mixing bowl, combine flour, sugar, baking powder, and sea salt. Remove butter from freezer and cut into dry ingredients using a pastry cutter, until mixture resembles coarse crumbs. Add milk, stirring gently until mixture is just incorporated. Remove brie from freezer, chop into small cubes (approx 1/2"), and add to bowl. Add orange zest and dried cranberries and gently fold to mix. Turn dough onto a floured surface and use hands to gently pat into a ball (sprinkle a little extra flour on dough and hands as needed). With a rolling pin, gently roll dough to a large circle, 3/4-1" thick. Use a sharp knife to slice into 8 large or 16 small triangles, transferring all to a parchment lined baking sheet. In a small bowl, whisk together 1/2 egg and 1 Tbsp milk. Use a pastry brush to brush mixture over the top of each scone (optional). Sprinkle with additional sugar (optional) and bake for 12-14 minutes or until tops are golden. While scones are baking, whisk together powdered sugar and orange juice. Set aside. Once scones are done, transfer to a wire cooling rack. Once completely cooled, drizzle icing over each. Things will be quiet here on the blog until after Easter. I pray you have a restful and worshipful week celebrating our risen Savior! Unfortunately this recipe did not work at all for me… Followed all the steps, did not overmix, but the dough would just not form a ball… Was way too crumbly , so i added a wee bit more milk, enough to be able to make it into somewhat of a ball… I couldn’t really make nice pieces but managed to cook them. Tasted good but didnt hold great. I’m so sorry to hear that, Becca – I hope the addition of the milk fixed the issue! Lovely combination of ingredients. Looks so delicious. A perfect holiday treat! Oh Dena, these look lovely! I’m starting to build an index of recipes I want to make for my future sister-in-law’s bridal shower and these are definitely being pinned to the bridal shower board! I’ve never tried making scones but I love them. And cranberry orange ones are my favourite. I think the brie would enhance the flavors nicely. Thanks!